My writing process goes like this: Write the article. Sleep on it. Look at the article again. Rip it apart, leaving comments as if it were someone else’s article. Fix it and turn it in. I find one way to improve my writing is to read the story from another person’s point of view, anticipating any questions that might be asked or information that needs to be double- or triple-checked. Note: The first draft of this opinion piece contained unnecessary information, needed slight word changes and had a paragraph about my personal experiences shared in a hypocritical way. I wrote about staying humble once accepted to college yet bragged about my own acceptance in the article. This message is what all seniors hope to read when we open our college portals. Some students will excitedly feast their eyes on celebratory messages while other students will struggle for a single acceptance letter. So if you receive a life-changing acceptance email in your inbox, think twice before posting on social media or bragging to your friends. According to its website, Stanford University has one of the lowest rates of acceptance in the country at 4.8 percent for 2016. University of California, Merced, on the other hand, admitted 73.7 percent of applicants who applied for the 2016-17 school year. These two universities magnify just part of the range of schools that Davis High students attend after graduation. For some parents of students, graduating high school itself is the highest level of education they pursued. For others, high school was a prologue to their additional four or however many years of schooling. Of Davis High’s 2016 graduating class of 513 students, a quarter (129 students) chose to attend one of the ten University of California campuses, while another quarter (123 students) chose a two-year college or vocational program and an additional 20 percent (100 students) picked a California State University. Other students’ selected colleges can be seen in the chart at right. Six percent of graduating students did not attend college but instead followed alternative career paths such as entering the workforce or joining the military, according to DHS’ website. Clearly, not every student dreams of a degree from Dartmouth, but some do study sleepless night after night in hopes of transforming that dream into a reality. These students likely applied Early Action or Early Decision to their schools of choice. Generally, students use this opportunity to apply to their reach schools, which can ultimately lead to crushed spirits or tears of joy depending on the content of the letter they receive. This year, Harvard University admitted 14.5 percent of the 6,473 Early Action applicants, which amounted to 938 students, according to the Harvard Gazette, the weekly newspaper published by the Harvard News Office. While 14.5 percent is significantly higher than the overall acceptance rate of 5.4 percent, the number is so minute that some students still find themselves faced with rejection. Adding to the environment of anxiety and disappointment, one student’s reach school might be another student’s safety school; another reason to take caution when rejoicing. I have heard students who take nearly all the AP and honors courses offered repeatedly bash certain California public schools, and I want to urge my peers to think about how that would feel to our classmates who are interested in those campuses. Every school has strengths, and California public schools are good schools. So there is no reason to talk negatively about those or any other colleges. I was accepted to my preferred school and immediately posted on Facebook. I shared the news around my friend group and regretted the decision almost instantly. Only one of my friends had also received an acceptance letter. One friend had been deferred, and another friend had not been accepted to any schools yet. I tried to place myself in their shoes and imagine how I would feel hearing about their college acceptance. Instead of being happy to hear about their news, I could easily picture a swirl of emotions including jealousy and anxiety inside of me. Now, I am more conscious about what I say regarding college. So yes, you have every right to be proud of your accomplishments and celebrate, but be considerate of the people around you who are still wishfully waiting on those acceptance letters. Go right ahead and put “Columbia ‘21” in your Instagram bio, but do not talk excessively about your soon-to-be home in front of friends who are still waiting to hear from colleges, and absolutely, do not demean other schools. Ever. Note: While at the California Scholastic Press Association Journalism Workshop at Cal Poly last summer, I had the chance to participate in multiple simulation tasks. The Sony Hacking simulation task was a two-part assignment: write an initial story with only a press release, and then edit the story/add more information. Following the message is a list of data links the hackers are threatening to release. According to the image, Sony has until 11:00 p.m. (GMT) to decide what they’re going to do. Sony Spokeswoman said the company is “investigating an IT matter” and refused to give more information. Following the initial security breach on Sony Motion Pictures on Nov. 24 by #GOP, a spreadsheet allegedly containing personal information of Sony employees has been leaked online, sources said. The document contains several executives’ salaries and the Social Security numbers of 3,803 employees, sources also said. Judd Apatow, Sylvester Stallone and Rebel Wilson were a few of the 47,000 people whose personal information was released due to the Sony security breach data-security consulting firm Identity Finder said. Also leaked were emails containing information about the upcoming Ghostbusters movie. The FBI is now investigating the matter, and Sony has enlisted Mandiant–a cyber forensics unit of security–to search for the hackers, sources said. While it’s unknown where the hackers are from, North Korea propaganda outlets have vowed to take action against the the U.S. if The Interview is released, authorities said. A spokesman for the North Korean government told the BBC: “Wait and see,” when asked about possible involvement in the attack. Note: Editing is just as important for multimedia journalism as it is for text. 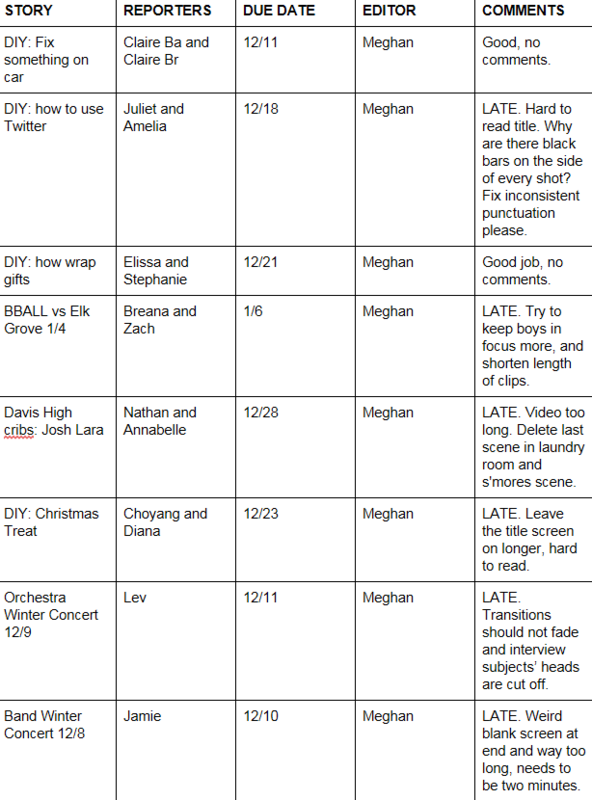 I provide feedback to student-journalists on their videos, detailing mandatory edits that must be completed before their work can be published. Here is December’s video feedback. Note: By second semester, reporters, photographers and graphic artists begin making small mistakes and missing deadlines. In response, I created a PowerPoint re-teaching all the basics including how to write lively ledes, concise captions and correct photo/video credits. Stories are now meeting deadlines with little to no AP style mistakes.